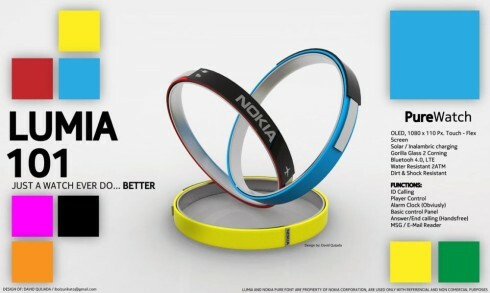 Designed by David Quijada, the Nokia Lumia smartwatch feels like a bracelet of sorts, a very comfy and elegant accessory. This model is much thinner and lighter than other high end watch concepts I’ve seen. It’s got an OLED 1080 x 110 pixel touch and flex screen, solar charging and Gorilla Glass 2 protection. There’s also Bluetooth 4.0 on board, LTE and the watch is water resistant, as well as dirt and shock resistant. We’ve got ID calling abilities here, player control, handsfree call answer features and email reading abilities. Nokia Lumia 101 is shown in a variety of colors, like blue, yellow and red and its display is so subtle, you may not even notice it. It’s also flexible , so there’s no danger of damaging it easily. It’s also a fashionable bracelet to be wearing around, especially if it lights up at concerts.